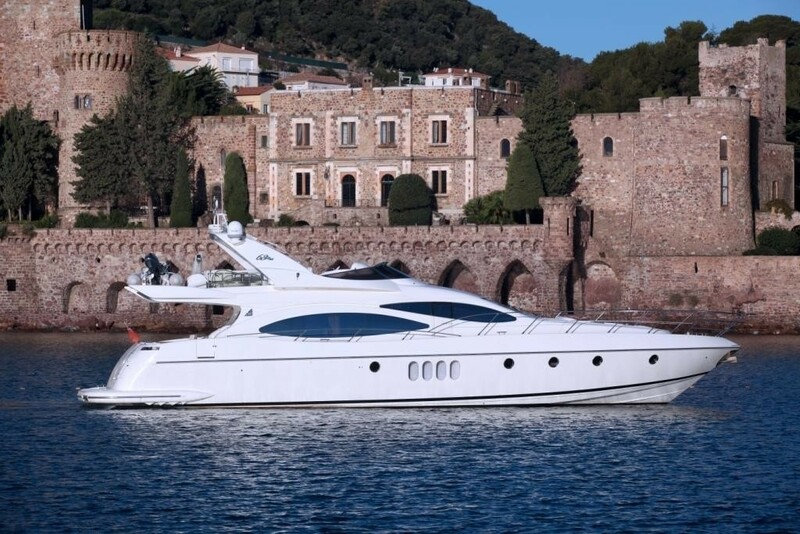 Custom 71ft Luxury Azimut motor yacht PRINCESS SISSI invites guests to experience the highest level of pampering and personal service onboard their own magnificent floating resort. 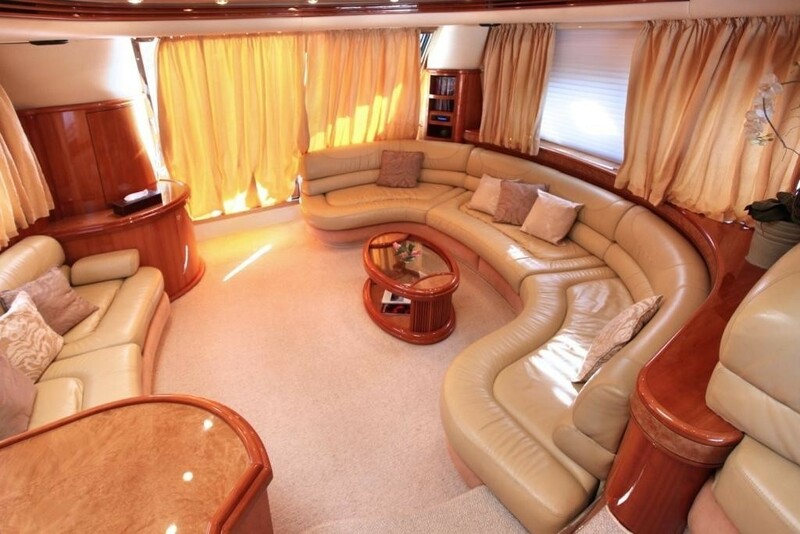 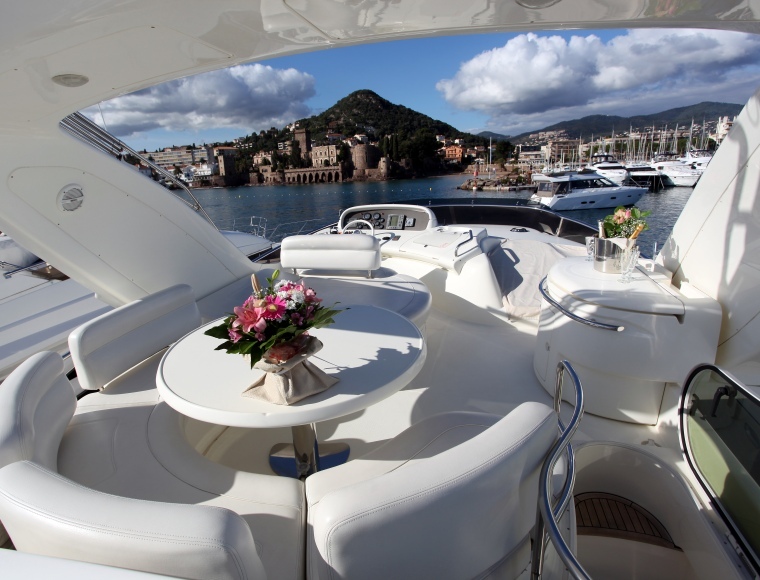 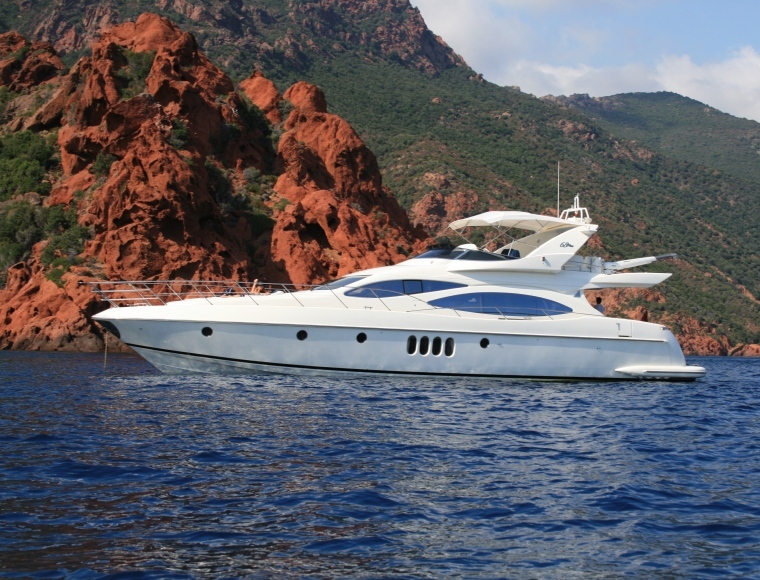 Available for private charter throughout the Western Mediterranean including the French Riviera, Corsica and Sardinia, PRINESS SISSI is an excellent choice for couples and families who enjoy luxury and comfort while exploring the best cruising grounds the Mediterranean has to offer. 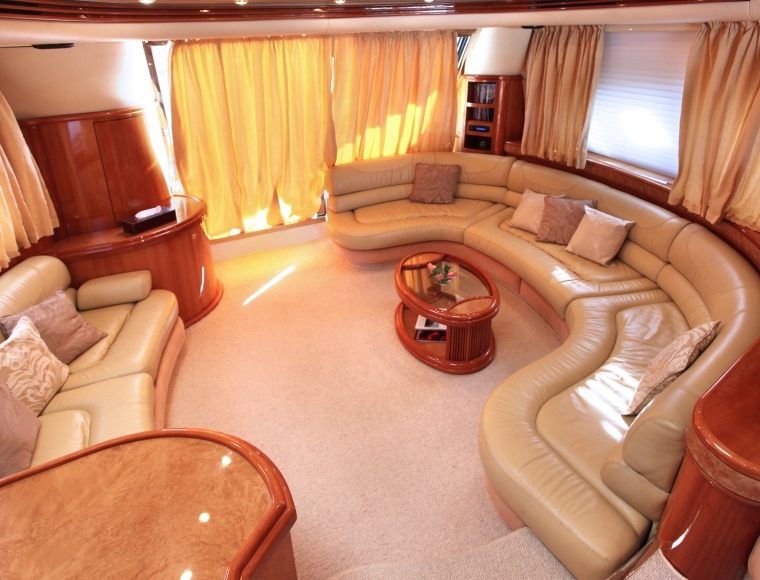 PRINCESS SISSI’s spacious and fully air-conditioned interior features luxurious leather upholstery and is decorated in rich and elegant earth tones, the perfect place to gather for pre-dinner cocktails and hors oeuvres or settle in for a cozy night watching movies. 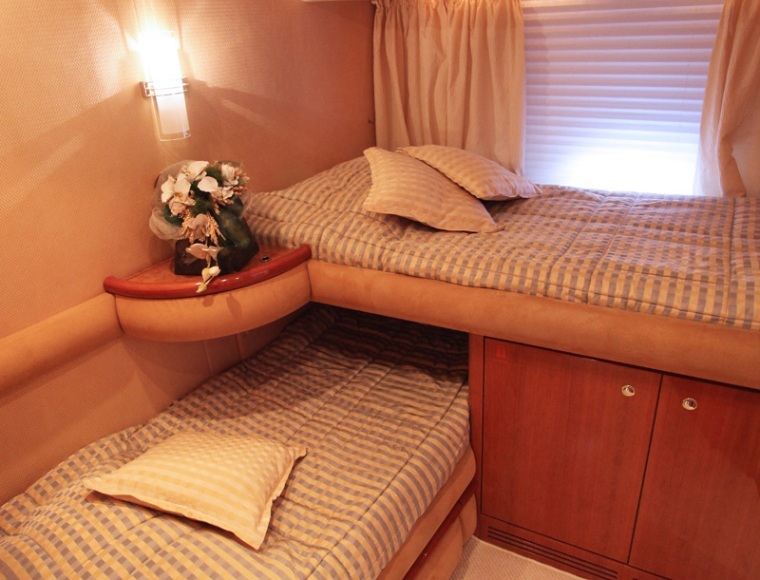 Her four beautifully appointed staterooms include a double Master and VIP, each with personal TV/DVD/Stereo systems, and two twin staterooms, all with a private bathroom and showers. 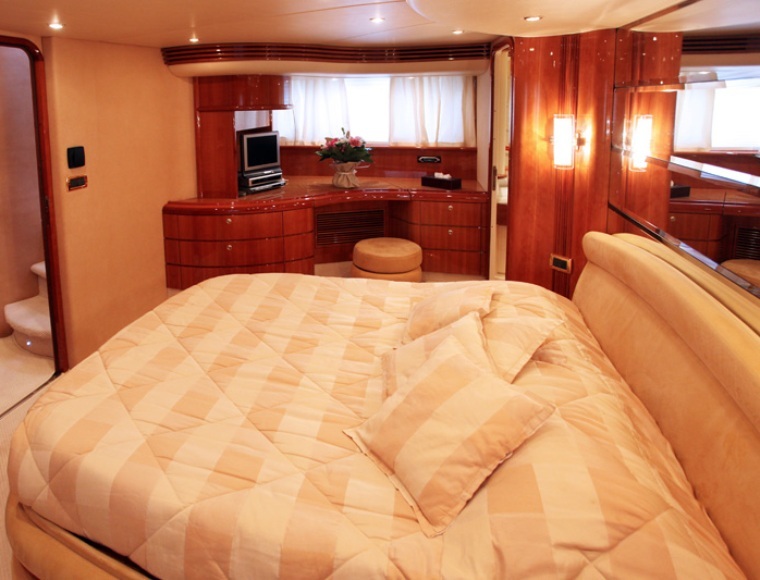 Above decks PRINCESS SISSI sleek and modern design provides plenty of deck space and a variety of areas for “getting away from it all”. 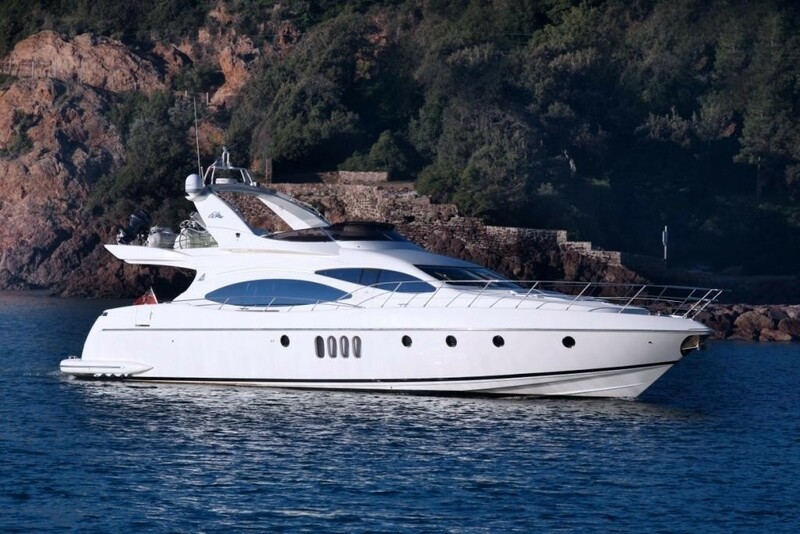 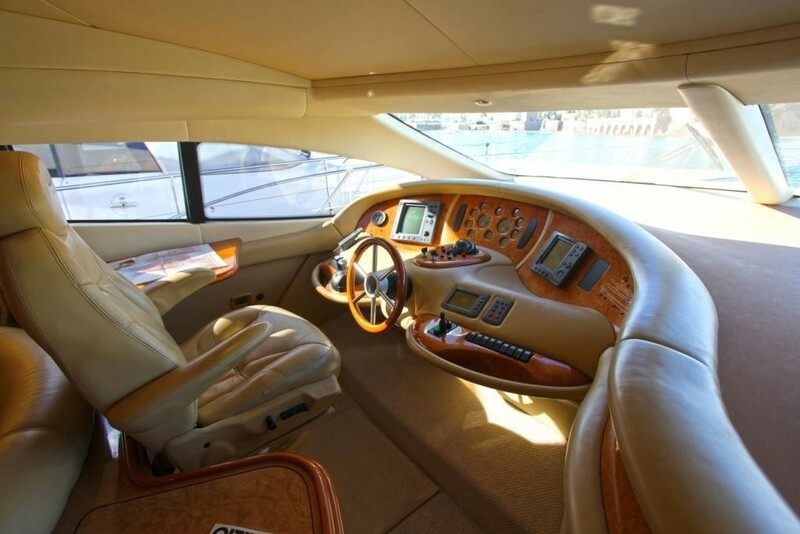 Her plush, cushioned sunbeds at the forward bow are the perfect place to lay back and work on your tan, stargaze, or take a front row seat while cruising the spectacular coastlines of Corsica and Sardinia. 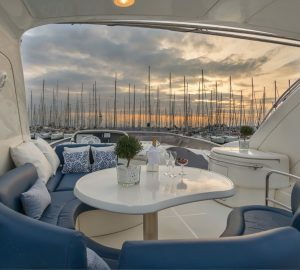 Her covered fly bridge offers a cozy seating area and table, an idyllic spot for a enjoying a cool beverage while taking in the panoramic views. 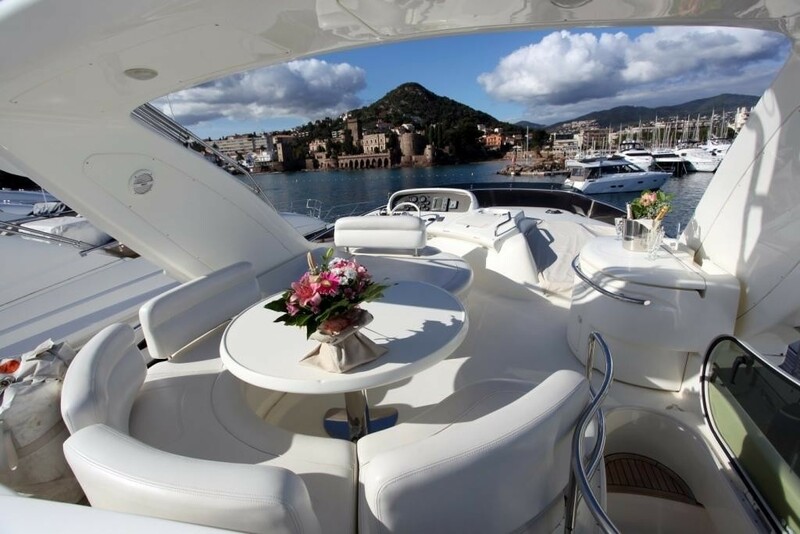 Retire to PRINCESS SISSI’s spacious aft deck seating area and indulge in your chef’s sumptuous gourmet meals and local delicacies al fresco in the cooling Mediterranean breezes. 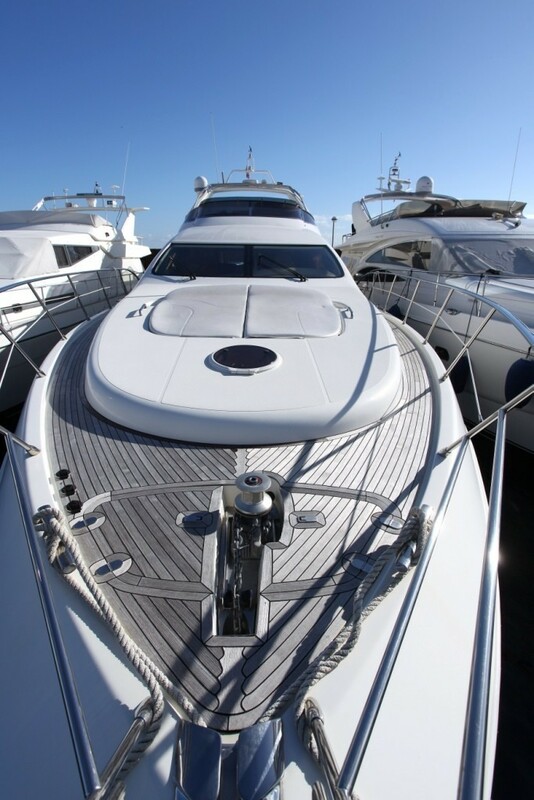 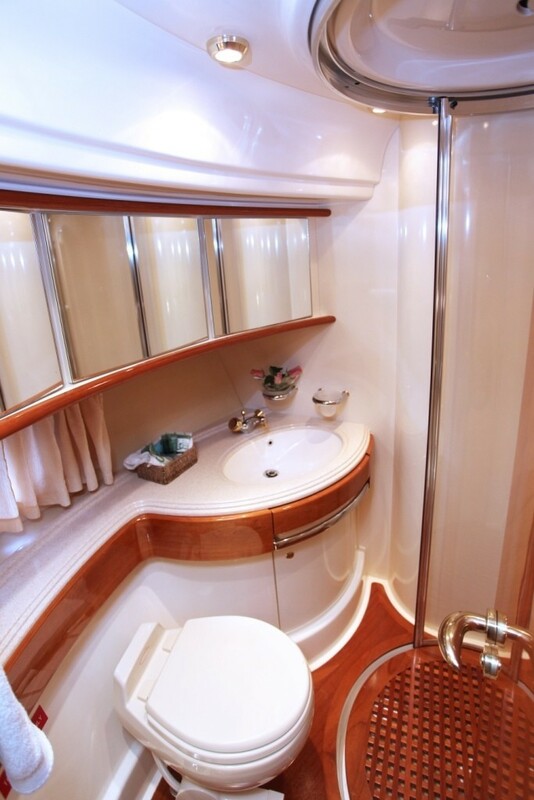 Offering easy access to the water toys and sparkling Mediterranean Sea, her aft deck also boasts a fresh water shower, just the right thing for your après-fun refreshment. 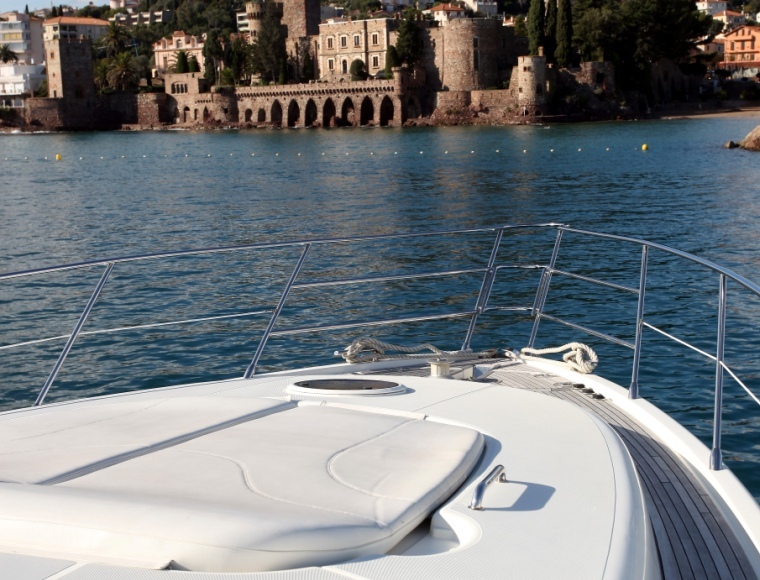 With so many options to choose from, PRINCESS SISSI insures that each guest will find their perfect place in the sun. 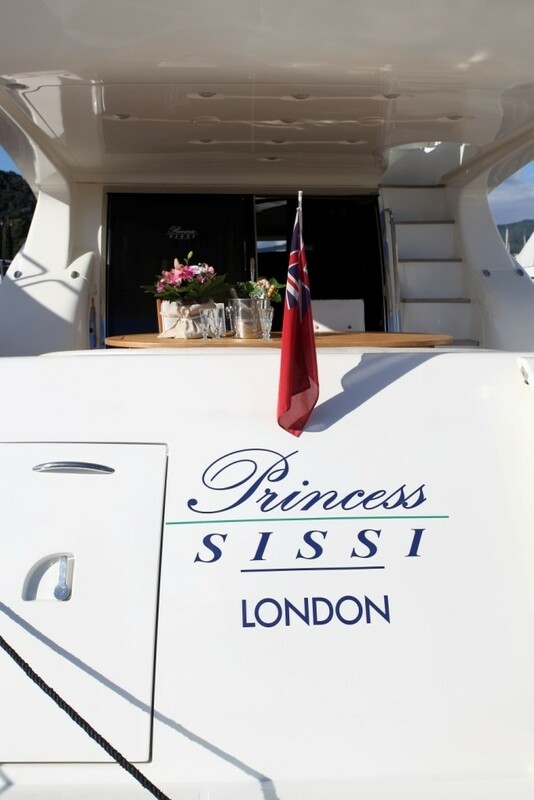 PRINCESS SISSI’s professional crew of two will cater to your every need, with a level of service and attention to detail surpassing the even the finest five-star resort. 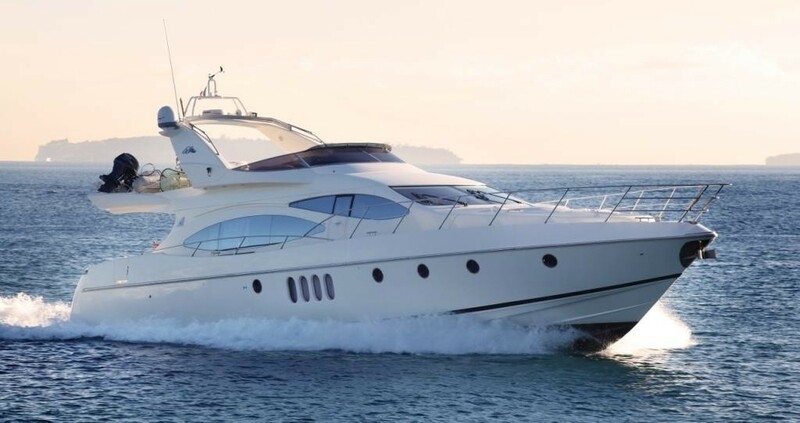 With their knowledge and experience of the best ports and most scenic anchorages, you can rest assured that you will experience an unforgettable holiday in some of the best cruising grounds in the world. 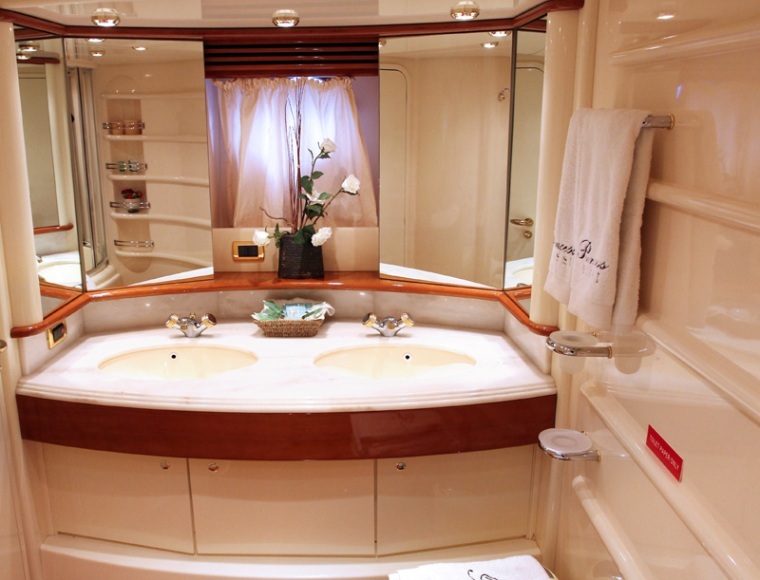 PRINCESS SISSI accommodates up to 8 guests in 4 spacious and elegant staterooms, all with private bathroom with shower, and fully air-conditioned with individual climate control. 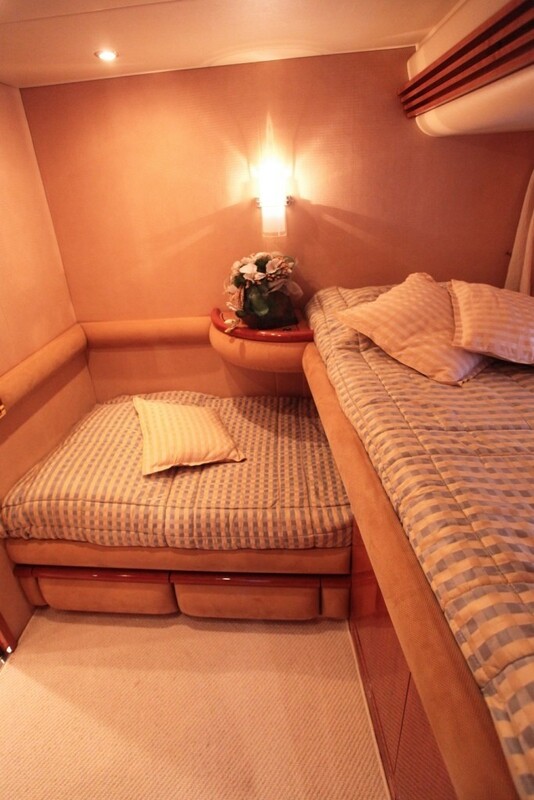 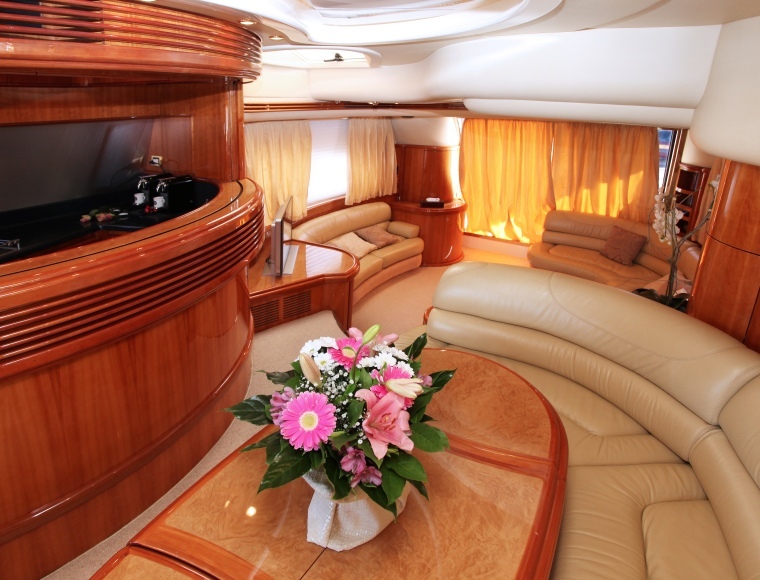 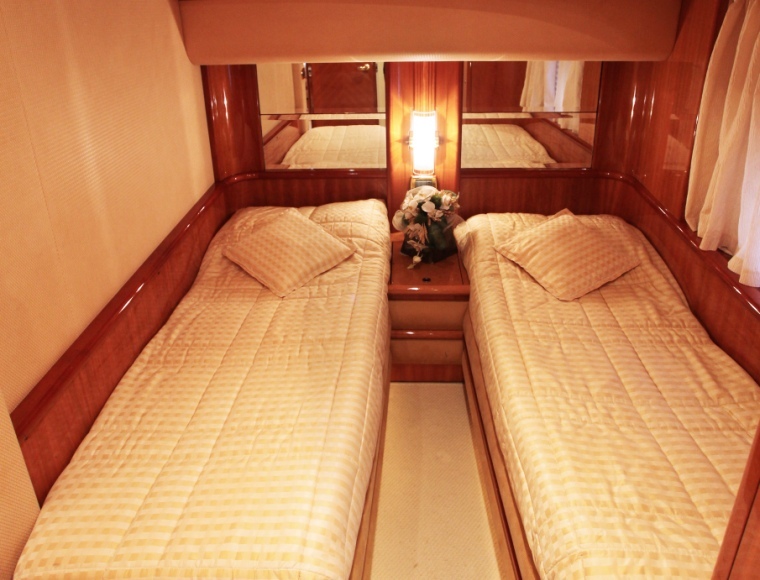 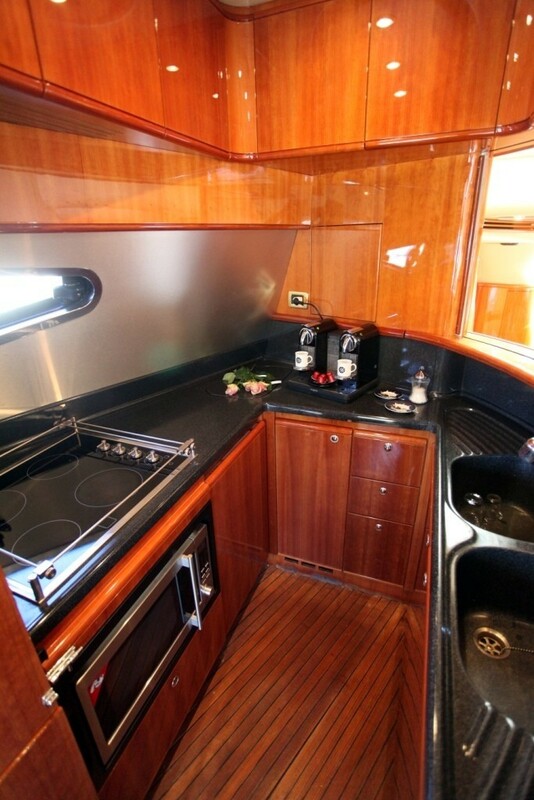 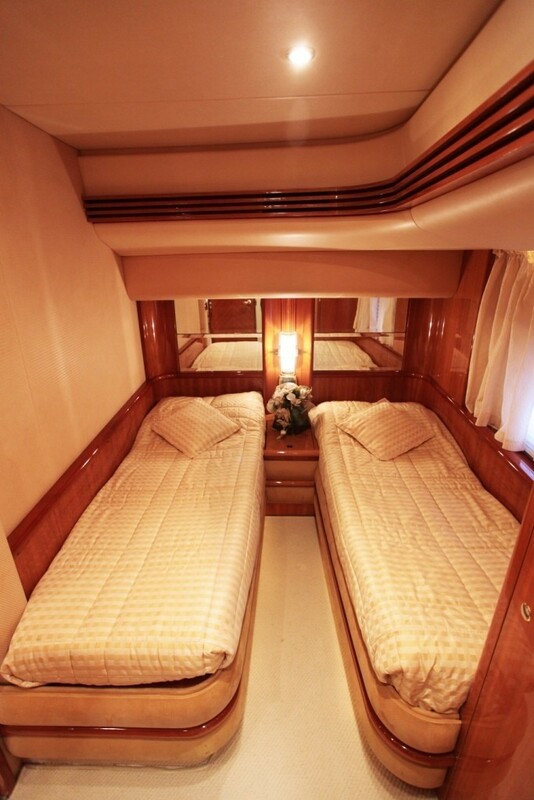 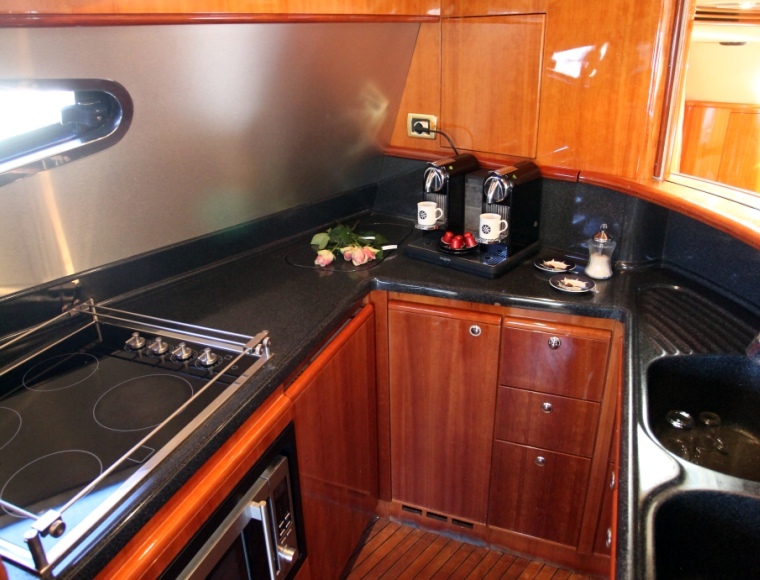 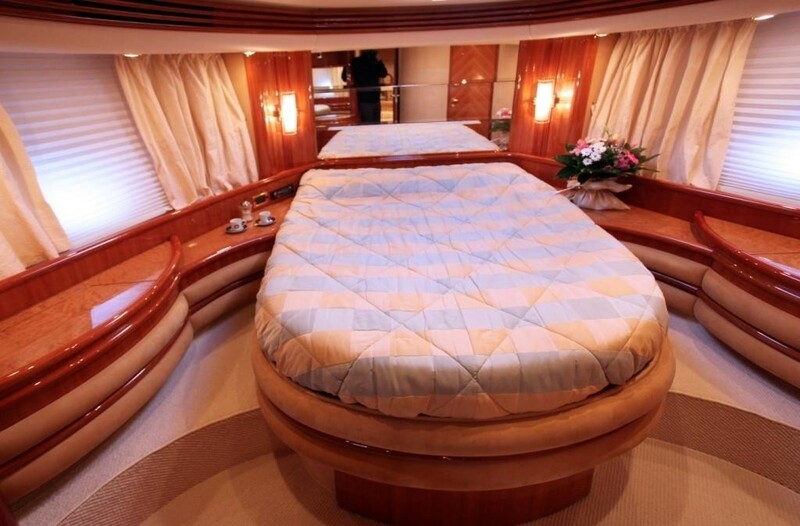 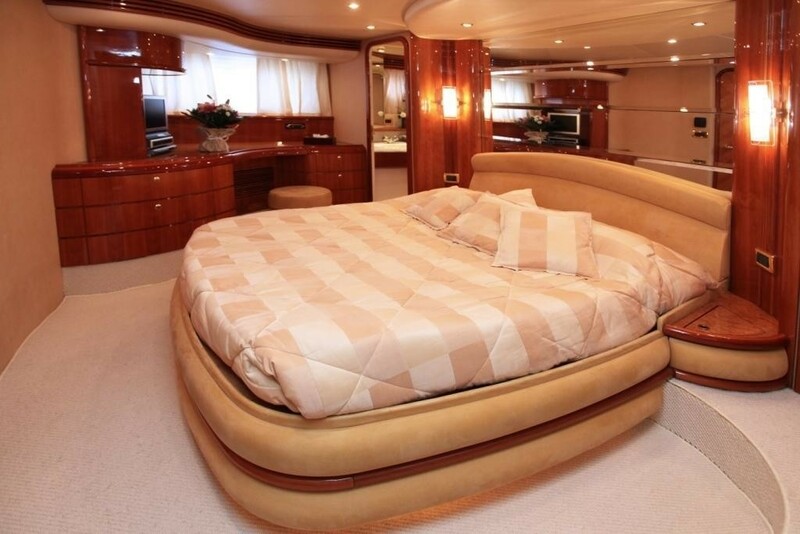 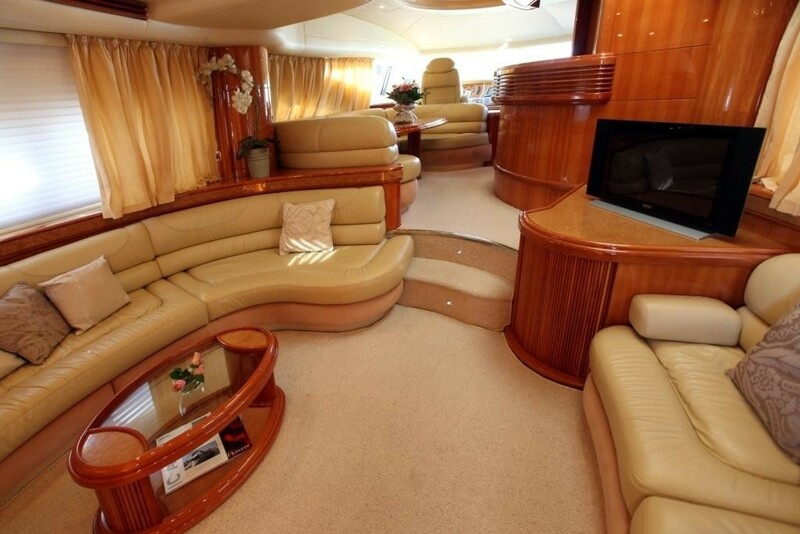 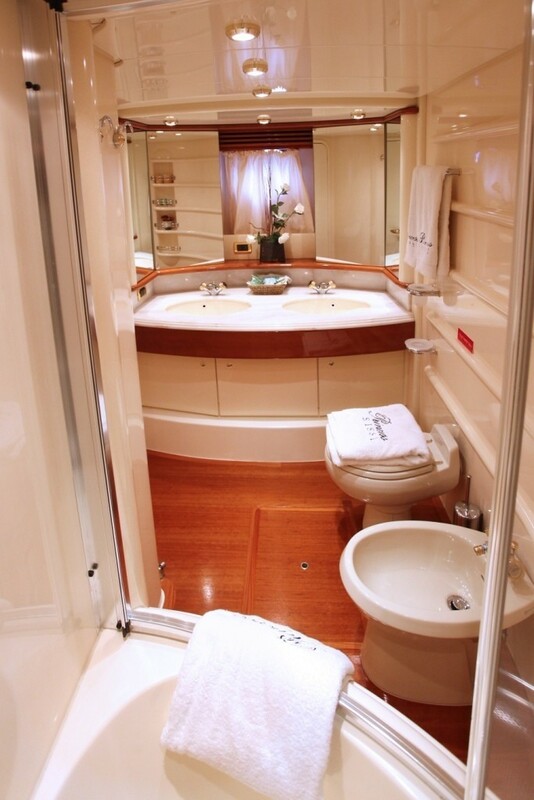 The Master Stateroom has a built in vanity/office area with seating, as well as his and hers bathrooms sinks. 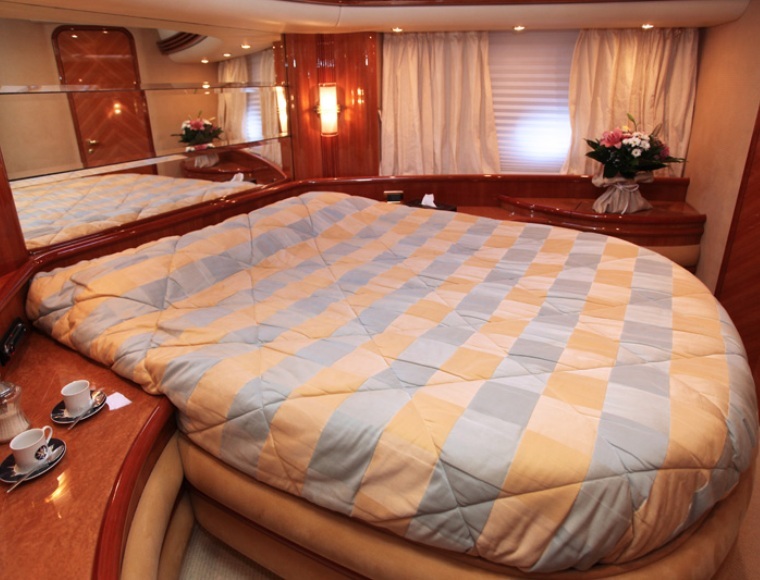 Recently redecorated, each boasts beautiful new wool carpeting and the finest imported bed linens. 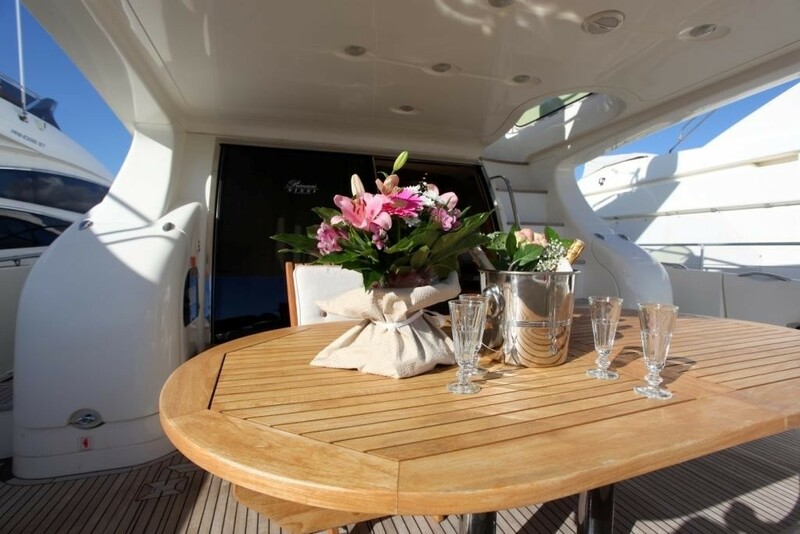 PRINCESS SISSI offers guests full air conditioning throughout, Satellite TV, DVD and stereo systems, and carries a Zodiac dinghy with 40 hp outboard perfect for waterskiing, and a full complement of snorkeling and fishing equipment.